﻿ Neymar: "Cristiano Ronaldo is a great player but Messi is still the best"
04.06.2013 » Neymar: "Ronaldo is a great player but Messi is still the best"
Neymar has finally arrived to Europe with his destination set to Barcelona. The Brazilian prodigy will join Messi, Iniesta and Xavi in Barça ranks, after several years of tons of speculation about his tranfer. Real Madrid has been one of many clubs interested in signing the 21-year old, but it appears that Florentino Pérez will now have to find a different attacking partner for Cristiano Ronaldo. This Monday, Neymar has undergone the usual medical exams, a necessary action before signing a 5-year contract with Barcelona and being presented at the Camp Nou before 56.500 Barça fans. The 21-year old forward also granted a few words to the journalists and didn't exactly hide from any eventualy more controversial question that has been predictably prepared for the Brazilian star. One of those was inevitably about the Messi vs Ronaldo never ending debate. 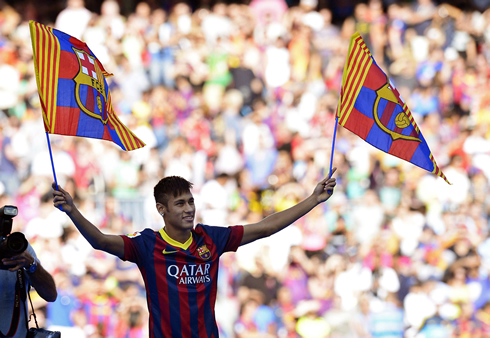 Neymar: "I want to make my name to be remembered in Barcelona's history. Real Madrid is a top club, but my heart belongs to Barça. This is my dream! Since I was a little kid, I've always admired players like Messi, Xavi or Iniesta... and so many others! 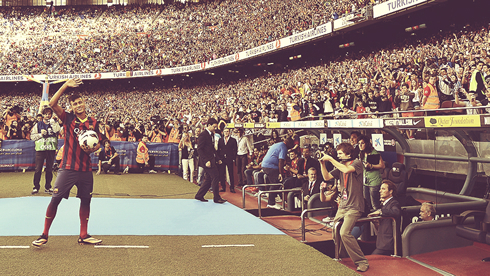 ", started off the 21-year old prodigy, who soon will probably realize the magniture of a Clasico. However, there's still no known date for the first Real Madrid live stream game against Barça, since the Spanish Super Cup will be disputed between Atletico Madrid and Barcelona. The Brazilian assured to everyone that it's not his ambition to dethrone Lionel Messi from being the best player in the World. 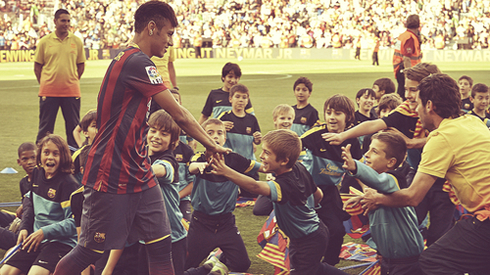 Neymar: "I'm not worried about becoming the best player in the World. That person is already in this club and his name is Messi. I'm actually one of the luckiest guys in the World! I came here to help Messi winning a lot more FIFA Balon d'Ors", surprisingly promised the former Santos FC forward. Neymar: "Real Madrid and Barcelona are two big clubs and I was delighted by knowing they both wanted to sign me, but the truth is my heart has always been with Barça. I took this decision with my family and we would have never done this simply because of the money that was beinf offered. To decide with our heart is to simply go where he tells you to go. The opportunity of playing with Messi, Xavi and Iniesta also ended up weighing in my decision. Moreover, Daniel Alves has also given me great references about the club", stated the new 57-million euros Barça signing. Neymar: "Adapting myself to Spanish football won't be easy, but I hope it will be quick. I don't think being far from my family will become an issue... I'm sure I'll get along just well with Lionel Messi, we'll be happy and focused in trying to win the most trophies possible. It's easy to play with the best football player in the World. I'm here to help him! I still haven't talked with him, but I'm sure I'll be giving him a strong hug very soon...", anticipated the Brazilian star. Over the past 4 years, the Spanish League has already been counting with the two best players in the World: Cristiano Ronaldo and Lionel Messi. Neymar praised the Portuguese player, but comprehensibly revealed his preference for his new Argentinian teammate. Neymar: "Cristiano Ronaldo is a great player... one of the best in the World, but Messi is still the number one", stated the 21-year old. 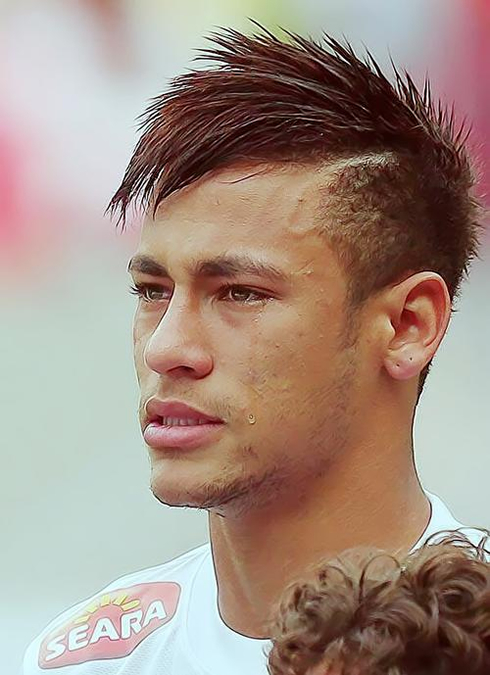 Neymar: "One of my biggest ambitions is to win the FIFA World Cup 2014 for Brazil. Everyone in the country wants for that to happen. For now, I'm focused on my new journey here in Spain and I believe everything will go the right way and that I'll be able to give many joys right from the start. I don't mind about the position where the coach wants me to play at. I enjoy playing in any position on the pitch. I wouldn't even mind playing as a goalkeeper, where Zubizarreta used to play", remarked Neymar Jr., as he revealed to have some good knowledge about Barça's recent history. Neymar: "I don't think I'm worth the 57 million euros Barcelona paid for me, but I'm very honored and thankful for the club to have helped me fulfilling my dream", concluded the Brazilian, who is expected to earn a salary of 7 million euros per year (after taxes). Neymar's wage will be roughly 43.75% of Messi's salary, since the Argentinian's current contract allows him to earn a yearly 16 million euros wage. As for Cristiano Ronaldo salary, he continues linked to Real Madrid with the contract he signed in 2009, earning 12 million euros per year. Neymar buyout clause has been set at 190 million euros. Cristiano Ronaldo next game will be for Portugal, against Russia, for the Brazil's FIFA World Cup 2014 qualifiers, on June 7, 2013. You can watch Juventus live stream, Portugal vs Russia, Croatia vs Scotland, Uruguay vs France and Miami Heat vs Indiana Pacers, all matches provided from our live streamings section.